In Norse mythology, Ymir ("groaner" or "twin"), was the primordial being (predating all worldly phenomena), from whom all living things are said to be descended. In some sources, he is also referred to as Aurgelmir (Old Norse meaning: gravel-yeller) and he is additionally known as the founder of the race of frost giants and the maternal grandfather of Odin. In the creation accounts preserved in Norse texts, Odin and his brothers slay Ymir, dismember him and utilize his body parts to fashion the cosmos. This mythic view of creation reflects an almost universal human fascination with cosmic origins revealing surprising underlying similarities in different cultural cosmologies. For example, the Norse tale about Ymir parallels Hinduism's own myth of cosmic origins found in Purusha, who was also sacrificed and dismembered to create the cosmos. Such convergences suggest an almost universal human fascination with understanding our origins. As a Norse deity, Ymir belonged to a complex religious, mythological and cosmological belief system shared by the Scandinavian and Germanic peoples. This mythological tradition, of which the Scandinavian (and particularly Icelandic) sub-groups are best preserved, developed in the period from the first manifestations of religious and material culture in approximately 1000 B.C.E. until the Christianization of the area, a process that occurred primarily from 900-1200 C.E. The tales recorded within this mythological corpus tend to exemplify a unified cultural focus on physical prowess and military might. Ymir, much like Purusha in the Indian tradition and Tiamat in Mesopotamian mythology, was a being who represented the ultimate ground of the cosmos. More specifically, he was a primordial entity who was killed and dismembered to allow for the creation of the present world order. Thus, as perhaps is fitting for a mythological system that was so focused on battle and conquest, the only way for Odin to form the kingdom of Midgard (and various other elements in the natural world) was by physically prevailing over an adversary. Given the insatiable nature of human curiosity, it is perhaps unsurprising that one universal genre of folklore is the cosmogony: the mythic attempt to explain the origin and fundamental principles of the universe. In the Norse context, these foundational myths center on the character of Ymir, who was universally recognized as the first living being. 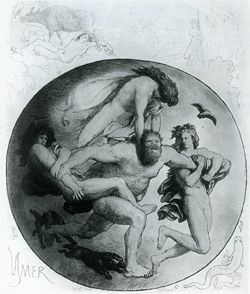 These tales are found in their earliest extant form in the Poetic Edda, with specific mention of Ymir in the exhaustive question and answer poem Vafþrúðnismál, the exhaustive mythic catalog of the Grímnismál, and the historically expansive Völuspá (which describes the cosmos from its creation to its destruction in the fires of Ragnarök). However, they reach their most synoptic form in the Prose Edda of Snorri Sturluson, who unites the sources mentioned above with others that have not survived into the present into a coherent and systematic whole. But a yawning gap, | and grass nowhere. Long since, thou giant sage?" And thus so fierce are we found. In this way, the text suggests that the elemental being somehow congealed from the frosty waters of Elivagar ("storm-waves"), which implies an image of the roiling, unordered waters. It should be noted that the "Aurgelmir" referred to in this passage can be positively identified with Ymir, as suggested by a genealogical account elsewhere in the text. While this provides a more detailed picture of the cosmic genesis, it still leaves many elements unexplored and many questions unanswered. Ginnungagap, which faced toward the northern quarter, became filled with heaviness, and masses of ice and rime, and from within, drizzling rain and gusts; but the southern part of the Yawning Void was lighted by those sparks and glowing masses which flew out of Múspellheim. ... Just as cold arose out of Niflheim, and all terrible things, so also all that looked toward Múspellheim became hot and glowing; but Ginnungagap was as mild as windless air, and when the breath of heat met the rime, so that it melted and dripped, life was quickened from the yeast-drops, by the power of that which sent the heat, and became a man's form. And that man is named Ymir, but the Rime-Giants call him Aurgelimir and thence are come the races of the Rime-Giants. Of course, the use of the term "man" as a descriptor is simply poetic license, a fact that follows naturally from the depiction of this being as the progenitor of the Jotun. Who never a giantess knew?" A son that six heads bore." Thus, the race of giants were understood to have emerged through a process of asexual reproduction from (the sweat of (?)) Ymir. The only notable addition that Snorri's account makes to this depiction is that it provides an explicit moral evaluation of the proceedings, stating: "By no means do we acknowledge him God [for his role in the creation]; he was evil and all his kindred: we call them Rime-Giants." Following the spontaneous generation of Ymir (and his offspring), these proto-beings found themselves without a source of sustenance. Fortunately, the primordial fluids also congealed into the form of an enormous bovine, Audhumla ("hornless and fecund"), whose copious udders produced four rivers of milk. This cow, in turn, fed off of the salty blocks of ice that made up much of the early world. As she licked away the rime ice, she eventually revealed the body of a god named Búri (the first of the Aesir). Eventually, Búri married a giantess (one of the children of Ymir) and fathered Borr. After a time, Borr and his wife Bestla (another female Jotun) had three sons, named Odin, Vili and Vé. Though it was not apparent to the unwitting giant Ymir, the birth of these divine beings was the first step towards his own undoing. Without offering an explanation or rationale (save perhaps the implicit notion in the Prose Edda that the incontestable evil of the giant required response), the mythic sources next describe Odin and his siblings callously murdering the primordial giant. Then said Gangleri: "What covenant was between them, or which was the stronger?" And Hárr answered: "The sons of Borr slew Ymir the giant; lo, where he fell there gushed forth so much blood out of his wounds that with it they drowned all the race of the Rime-Giants, save that one, whom giants call Bergelmir, escaped with his household; he went upon his ship, and his wife with him, and they were safe there. Of his skull the heavens high. They made to move on high. Snorri's account offers few elaborations upon the Poetic prototype, save an explicit depiction of the gods fashioning a separate realm for the mortals and the giants. Describing their earthly creation, it is stated that it is "ring-shaped without, and round about her without lieth the deep sea; and along the strand of that sea they gave lands to the races of giants for habitation. But on the inner earth they made a citadel round about the world against the hostility of the giants, and for their citadel they raised up the brows of Ymir the giant, and called that place Midgard." Also, he makes the intriguing suggestion that the four corners of the cosmic firmament are supported by four dwarves (Nordri, Sudri, Estri and Ouestri), which correspond to the four cardinal direction. The striking imagery surrounding the creation of the cosmos inspired a number of standardized poetic kennings for various worldly phenomena. Some of these, presented in the dialogical format of the Skáldskaparmál, include: "How should the heaven be periphrased? Thus: call it Skull of Ymir, and hence, Giant's Skull ... How should one periphrase the earth? Thus: by calling her Flesh of Ymir ... How should one periphrase the sea? Thus: by calling it Ymir's Blood." To create the cosmos, the gods killed a maternal relative. This may be seen as the first of three killings within the family in the mythology. The second is the death of Baldr at the hands of his half brother Höd, and the third would be the set of killings at Ragnarök, when giants and gods, inextricably linked through Ymir and Audhumla, kill each other off and destroy the cosmos that was created through the first killing. In a disputable etymology, W. Meid (1992) has linked the names Ymir (which can be reconstructed in Proto-Germanic as *umijaz or *jumijaz, in the latter case possibly deriving from Proto-Indo-European *ym̩yos) and the name of the Indic death deity Yama, reconstructed in PIE as *yemos, from the root yem "twin." Yama shares with Ymir the characteristics of being primeval and mortal, but in other respects is a very different character, the first of mortal men and kings who after death becomes ruler of the realm of the dead. ↑ Orchard, 404; Turville-Petre, 278. ↑ See Turville-Petre for a brief discussion of this process of composition (275). ↑ Völuspá (3), Poetic Edda, 4. Translated by Henry Adams Bellows, 1936. Retrieved June 23, 2007. ↑ Vafthruthnismol (30-31), Poetic Edda, 76-77. Translated by Henry Adams Bellows, 1936. Retrieved June 23, 2007. ↑ Orchard, 43. The interchangeability of these names is also attested to in Turville-Petre, 275-276. ↑ Snorri Sturluson, Gylfaginning V, Brodeur 17-18. This cosmological schema (cold/wet meeting hot/dry and generating life) is discussed from a cross-cultural perspective in Bruce Lincoln's "The Center of the World and the Origins of Life," History of Religions 40(4) (May 2001): 311-326. ↑ Vafthruthnismol (32-33), Poetic Edda, 77. Translated by Henry Adams Bellows, 1936. Retrieved June 23, 2007. ↑ One of the few elaborations Snorri makes on this point is to explicitly list "sweat" as the creative fluid from which the male and female giants sprung. Sturluson, Gylfaginning V, Brodeur 18. ↑ Snorri Sturluson, Gylfaginning V, Brodeur 18. ↑ Orchard (ibid) notes that these four rivers could be a reference to the four rivers of Paradise mentioned in the Book of Revelations. ↑ Snorri Sturluson, Gylfaginning VI, Brodeur 18-19. ↑ Snorri Sturluson, Gylfaginning VII, Brodeur 19. Commenting on this passage, Turville-Petre notes that this flood of vital fluids from the injured giant is the only instance of a "deluge" tale in the Norse corpus (276). Indeed, some parallels certainly exist; namely, the survival of a single couple, who then repopulate the race. ↑ Grimnismol (40-41), Poetic Edda, 100-101. Translated by Henry Adams Bellows, 1936. Retrieved June 23, 2007. For comparison, see also the Vafthruthnismol: "Out of Ymir's flesh | was fashioned the earth, // And the mountains were made of his bones; // The sky from the frost-cold | giant's skull, // And the ocean out of his blood." Vafthruthnismol (21), Poetic Edda, 74. Translated by Henry Adams Bellows, 1936. Retrieved June 23, 2007. ↑ Snorri Sturluson, Gylfaginning VIII, Brodeur 20-21. ↑ Snorri Sturluson, Skáldskaparmál XXIII, XXIV, XXV, Brodeur 134, 136, 137. ↑ See also Turville-Petre, 278 and 319 ff 11. Grammaticus, Saxo. The Danish History (Volumes I-IX). Translated by Oliver Elton (Norroena Society, New York, 1905). Accessed online at The Online Medieval & Classical Library Retrieved May 12, 2008. Meid, W. Die Germanische Religion im Zeugnis der Sprache. In Beck et al., Germanische Religionsgeschichte – Quellen und Quellenprobleme. New York, de Gruyter, 1992. 486-507. Munch, P.A. Norse Mythology: Legends of Gods and Heroes. In the revision of Magnus Olsen; translated from the Norwegian by Sigurd Bernhard Hustvedt. New York: The American-Scandinavian foundation; London: H. Milford, Oxford University Press, 1926. Page, R.I. Norse Myths. Bath Press, 1990; University of Texas Press, 1996. Sturluson, Snorri. The Prose Edda. New York: American-Scandinavian foundation, 1916. Available online at The Prose Edda Retrieved May 12, 2008. "Völuspá" in The Poetic Edda. Translated and with notes by Henry Adams Bellows. Princeton: Princeton University Press, 1936. Accessed online at sacred-texts.com Retrieved April 13, 2007. Young, Jean I. The Prose Edda of Snorri Sturluson: Tales from Norse Mythology. Bowes & Bowes, 1954. This page was last modified on 12 May 2008, at 17:58.